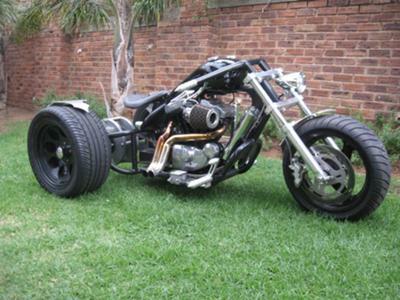 The idea and inspiration for my M2 Cyclone Trike came about when I saw the trike that Russell Mitchell of Exile Cycles built on the TV show Biker build off. My first trike I built out of a GPZ 1100 and this I used as my 'school fees' for trike building as I needed to figure out how to make a dry diff to run an open chain drive. Once I had this under the belt it was time to find a proper donor motorcycle and to stock up on some essential equipment needed to build a custom frame, to my spec. A Buell M2 Cyclone came up for sale and it was exactly what I wanted and needed to start with my custom trike. On the second of January 2010 I started building a frame jig and inserted the motor to start the build of the frame around it. In the middle of January, with all the components secured in place in my frame jig, I was ready to start with the first tube to be cut, notched, inserted and tack welded in place. It was going well so far and the rest of the tube cutting, bending, notching and tacking went off without any hiccups. By the end of the weekend I had a fully tacked together series of tubes that resembled a one off custom frame. I could not believe the short amount of time it had taken to get to this stage. The above mentioned turned out to be the easy part. The real challenge came to the fore front when the welding and the grinding started, this was the point where my trusty friend was recruited to help with the real manual labor, this took about two weekend to prep the frame. All while, this was happening my fellow bike club member was busy with the specialized billet engineering of parts that I had drawn up. Finally my friend and I assemble the trike into a rolling chassis and made sure there were no more modifications needed and that everything was working as planned. Time to strip down and send for powder coating, spraying, polishing and chroming. start receiving parts back and final assembly starts and the dreaded hiding of wiring loom inside the frame tubes. 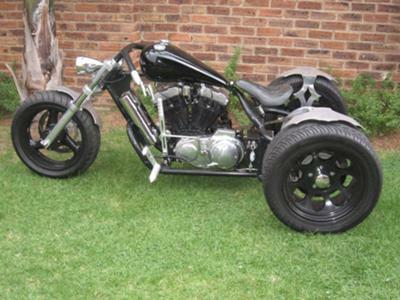 More or less 80 hour and the trike was fully assembled and ready for the exhaust pipe to be made. The first ride was very rewarding as it went of without a hitch and it was right then that I felt the hard work had been worth it. Getting used to the suicide shifter and foot clutch took a couple of attempts to get right but it became second nature after a couple of good rides. 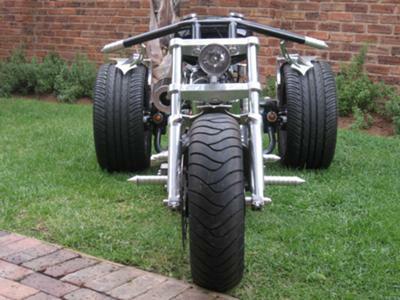 The trike is extremely stable on the road and it pretty much feels like it is running on rails, where you point the nose it goes with no argument, it gives you the same feeling as a Go-Kart and there is a lot of positive feedback generated through the front end. Having a solid beam axle definitely helps with cornering at higher speeds as the weight falls on the outer wheel, which in turn digs into the road surface and starts pushing you in the right direction instead of you getting under steer. Having a rigid rear end, a person would expect that this would be a very bumpy ride but this is rectified by under inflating the oversize rear car tires to 0.7 bar and as the tires were developed for much heavier loads the side walls stand up pretty well at the low pressure. Having said this they act as suspension, which is missing on the frame, and the seat suspension gives a very cushion ride. Having two 63mm diameter pipe have their pros and cons. Pros is that the cage driver can hear you from a mile away and therefore don't pull idiotic maneuvers just in front of you. Cons are that not everyone in my complex appreciates the sound of a V-twin starting up and pulling off at 6h00 on a Sunday morning for a Breakfast run. But as one of the, bike build off, builders said, 'If you don't piss a couple of people off, you didn't do it right'. More so I have recently entered a local Bike Show and received first place for the trike class. great looking bike...reminds me of a modern take on a servicycle..and much cooler than the one o.c.c. built!!! 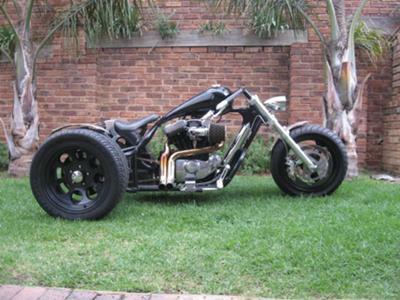 Nice 1 and from down south too,im also from S.A busy with a chopper-vf750 motor and a 69triumph 500 bobber ,where did you bend your tubing?My email is creativebakers@yahoo.com.Well done looks wikid! Nice build bro. Looking to do the same in the near future.